So, recently, I went to the School of Saint Anthony, right next to the Basilica. There, I saw some paintings that I have only ever seen thumbnails of and really started to understand a lot of the early 16th C dress in Veneto (Venice/Padua/Vicenza/Verona) much, much better. First, the lady whose baby fell into the boiling pot - the story goes that the baby fell in and was miraculously brought back to live by Saint Anthony. It's sadly one of those things that still happens today - you turn away for one second and the toddler has poured the soup pan on themselves or pulled the iron down on their head. The panel where the woman has the red sleeves and the shaw depicts just that. She's a bit away while the baby falls in. In the second panel, she's showing the perfectly healed baby off to the Saint and others. The neat thing about these two panels is she's wearing the same dress so it's nice to see both with sleeves and not. I also love the red hem, how the skirt bellows a bit in the back, and that coif! The hem on this dress is a lovely red trim and the dress is green in person, not gray. Yet, it doesn't look like a Christmas tree either. I love seeing the open wide sleeves and the back of the dress! I've been trying to figure this one out and, it's so different, I'm still not sure all of what is going on. It looks like a lavender bodice with an orange sari for the skirt and false lower sleeves. It appears to be going off the older style of the upper and lower gauntlets that were popular about 20 years earlier. There were so many details in this that I wanted to capture - the scales on the skirt and the black star pattern I think, show, the pallu of the sari and the rest of the sari. The lower sleeves appear to be made out of the rest of the sari. For those not familiar with saris, they are worn mostly in India and neighboring countries. They tend to be about 5 or 6 yards long - making them excellent for costuming. The saris have typically three sections - the first yard of the sari is for making the blouse piece, the next three to four yards are the skirt, and the last yard or so is the pallu. Pallu is an Indo-European word (Palla in Latin!) that means decorated/embroidered piece of women's clothing. That's all the pallu is - it's the heavily decorated part of the sari that gets draped over the shoulder. Because the sari is normally cotton or silk in period (and often still), they would make it along the Silk Road. It's not hard to trace a sari to Italy from India and figuring it would be made into a local dress. There are so many dresses in these panels! The red dress with the blue beneath it, the fabulous green/silver skirt and sleeves with the black and orange bodice, the lady in the red dress with her back to us, and the drowned skirt in the bottom panel. Now, the drowned girl is not wearing just her bodice - it person, it's clearly a lightly greyish skirt and sleeves attached to the green and black striped bodice. I'll try to get a better picture next time. Really, it's fun looking at all this artwork in person and seeing new details. For more photos, check out my album on Iperntiy. First, my apologies if any of this is odd sounding or misspelled; the cat fell asleep on my right arm, hugging it. As most of you know, I moved to Italy in September. I didn't bring or send any of my Christmas decor from home so I had to buy new stuff. I'm on a limited budget for the next month (long story but moving is not cheap!) so I went to one of my new favorite thrift stores here in Italy. There, I bought this 5" faux tree for €15! Really, once I got it home and fluffed out a lot of the branches, it started to look pretty decent. Next, I had to get the lights and the decorations. I bought the lights at the local five and dime for about as much as the tree cost me. The nice thing is that the lights have 8 different modes - you can have them fade in and out, blink, chasing, randomly flicker, or be steady as well as a couple of other modes. The decorations I had to get creative with. Although I found some decent ornaments at the thrift store, I also made a few as well. First up is the very decorative "icicle". One of my tiaras didn't make it through the move - which is fine. I can easily get a new one. However, I saw an idea for reusing old jewelry as decorations and figured I'd take the pieces of the tiara and see what I'd come up with. Since I doubt many people reading have broken old tiaras lying around, also consider using that one earring you can never find the partner to or other jewelry odds and ends you probably do have about. I also used two old mardi gras "pearl" necklaces as garlands. They covered about 2/3s of the tree. Behind the stylized icicle, you might notice the white lace. Like anyone that does historical costuming, I have a lot of trims and fabrics as part of my stash. The lace is a wide one I use for 18th C undersleeves. I have yards upon yards of it. I used it as well as a garland. Not the best picture - I'll take a better one later. I bought 12 paper doilies for 99 cents at the local five and dime as well as some pretty nylon Christmas ribbons. From the local yarn and trim store, I got a bunch of ribbon roses for €1 which I used in making a few other decorations. For the snow cone, I cut the doilies into quarters. I took one of the quarters and put taped the edges together. I used silver glitter tape because I like glitter tape. :-) However, you can also use regular gift wrap tape. Once the cone is done, I added the lavender christmas ribbon to the back in a loop to hang it and on the sides as bows. I had to be careful not to rip through the holes on the sides of the paper. I also had these very generic cheap "snow ball" ornaments in Styrofoam and used that as a...snowcone. Anyway, I then matched the folds of the doily and the pink paper so that the doily covered most of the FT. I then took my yarn needle, put the lavender Christmas ribbon in it, and punched through the papers for a bow at the bottom but also to keep the papers together. You can also use a little bit of glue at the edges to keep them together. I added three of the purple roses for a bit more of pretty. The above looks very silly but gets lost in the rest of the tree pretty easy. I took some ribbons and wrapped the styrofoam and topped it with a ribbon. It's pathetic but eh, it's pink! I bought a door decoration at the five and dime for €1 and, when I took it out of the bag, one of the stars fell off. Rather than just throw it away, I put a bit of the silver curling ribbon through it and hung it on the tree instead. The rest of the door decoration looks lovely without it still. I hope everyone is having just as much decorating as I am! I had a lot of leftovers because I cooked like I was back home and not just for me an a couple of co-workers. 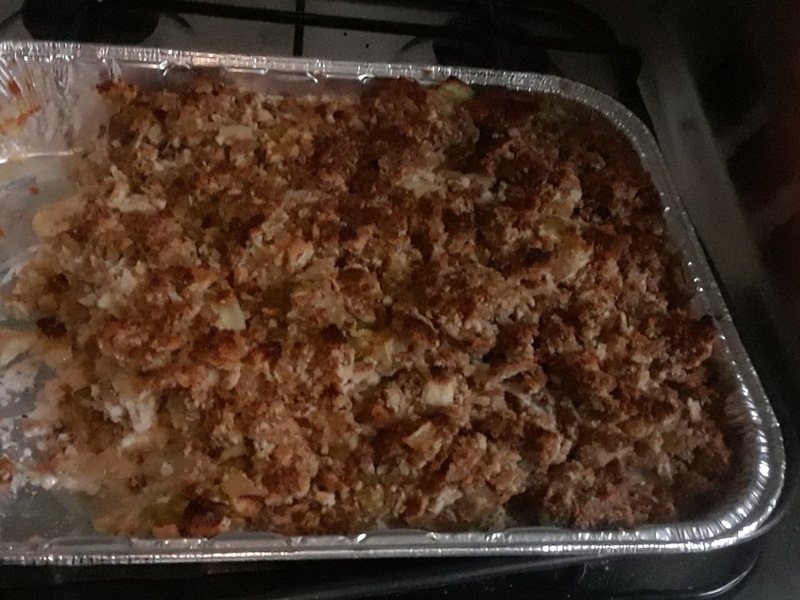 :-) So, I made Turkey casserole- an old favorite of mine- today out of the turkey and stuffing. enough turkey pieces to cover the bottom of the casserole dish (roughly under a pound for your average 9"x12"
That's it! You pull apart the turkey and cover the bottom of the casserole dish with the turkey. 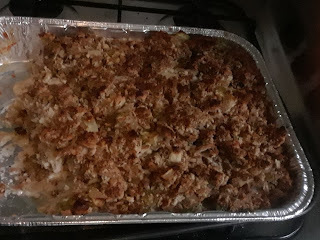 Once that is done, you just pour the cream of mushroom soup over the casserole dish (you might need two cans) and then put the leftover stuffing on top of that. Heat the oven to 350f and put the dish in for about 30 minutes. The dish is done with the stuffing is a nice medium brown (ie crisp!). If you are like me and can't have the regular campbell's cream of mushroom, don't worry! Here's what I did. In your soup/rice/everything that has a lot of volume pot, add the butter. Once it's melted, add the fresh mushrooms and fresh garlic. Once they are browned, add the chicken broth and wait for it to boil. Add the milk next and again, wait for it to boil. Add the canned mushrooms. Leave it on low heat to simmer for a few minutes. Add the sage and any salt you'd like. Once it's simmered for about 10 minutes, add a small amount of the flour and stir it in. Every time you add flour, stir it, and see if it is thickening. This can take a minute or so. Once it starts to thicken, just stir the soup until it's the consistency you are used to seeing with canned soups (slightly more liquid than gravy). I poured this over the turkey and then patted the stuffing on top of all this. Really, this dish is delicious and a good way to help reuse the leftovers. Also, since you are combining the turkey and the stuffing, it makes room in the fridge! And now, I have internet again! I took this photo of a beautiful example of mid 16th Century Venetian painting on October 29 2017 right outside of Padua. I'm currently living in Veneto, in Vicenza, which is about halfway between Venice and Verona. Yes, I'm eating up every minute of it. I will post a LOT more photos of these paintings I've seen in real life now. What I love about the one above is the mix of goldwork and blackwork in the outfit. The chemise has a lot of lovely blackwork but the partlet has a lot of gold work.